and pay homage to the greatest consumer electronics company of all time. OK, I admit to being a Mac Fanboy. I've got a MacBook, an iPhone and I'll be first in line for a new iPad when it hits the shelves. But I'm also a foodie with time on his hands. 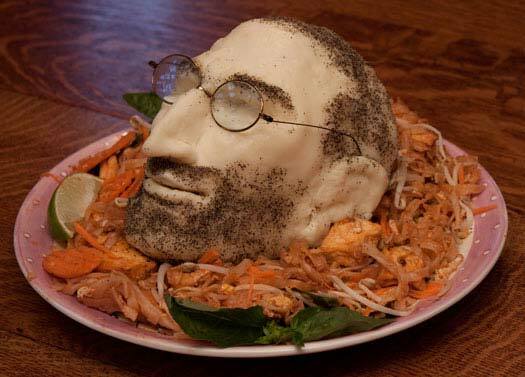 So what better way to show appreciation for my much-loved Apple products than to create a tasty sculpture in the form of Apple's venerable leader? And with Apple's latest blockbuster product launch just around the corner, I figured that my iPad Launch Party would be the perfect place for the unveiling. You ARE going to an iPad launch party, aren't you? make him a natural choice for bold food pairings. 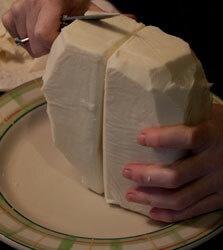 I figured that cheese was a great medium for food carving, and would go well with many a tasty meal. Mozzarella has the right consistency, is pliable when melted slightly, and its pasty-white color matches the skin tone of many a computer geek like Steve and myself. See below for directions on how to create your own Cheese Head and for three tasty recipes that go perfectly with Steve Cheese. If you're going to create your own tasty CEO goodness, make sure you've got some good pictures to reference while you carve. I used the one above, along with one or two profile shots so I could get the full 3D effect. 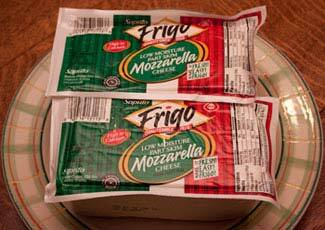 Start out with a few of those big blocks of mozzarella cheese. You can hold them together with toothpicks or chopsticks that have been neatly clipped. Next up, carve out the basic human skull shape. Don't worry too much about the details yet — just go for the large feature areas. Map out where you're going to put the eyes, nose and chin. A paring knife — I'm a fan of this one — works great for this type of work and for the detail work to follow. 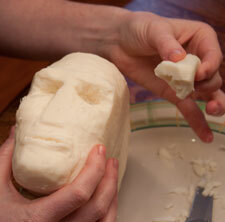 The nose and ears require detailed carving, so work on those separately. You can attach them with glue made of gobs of slightly melted cheese. 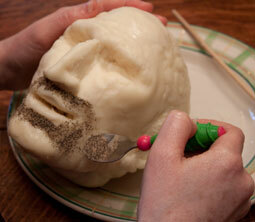 In fact, as you progress, those melted cheese blobs should be applied liberally to give the head its smooth, human look. Finally, apply the beard and hair using a flat spoon filled with ground pepper. Be careful with this step — it's a pain to remove specs of pepper once they've stuck to the cheese. Now that your Steve is carved and ready to go, choose from one of the following three delicious recipes to complete your meal. Please follow the recipes carefully — you should resist the temptation to throw Steve onto your barbecue at all times. 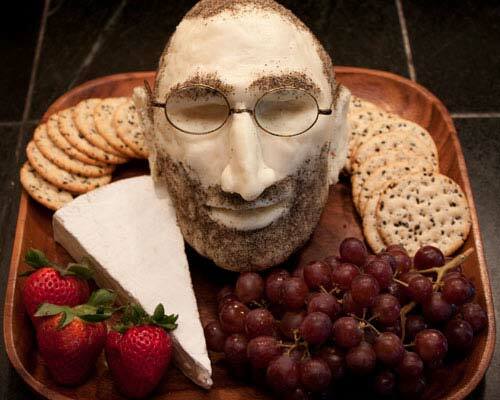 The cheese plate allows your guests to get a good look at Steve's entire head. 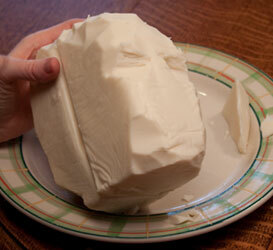 This recipe is a great one to choose if your sculpture has few imperfections. Simply mount the head on a base of partially-melted cheese and arrange various food items around the edges. Guests will be reluctant to take a carving out of your masterpiece, so you might have to be the first to dive in. I recommend starting with a nose or an ear — that way your guests will know you mean business. The pepper adds some zing to the somewhat-bland mozzarella. Steve has been known to be somewhat "spicy" to his underlings, especially around product launch time. What better way to celebrate this personality trait than with hot 'n spicy nachos? 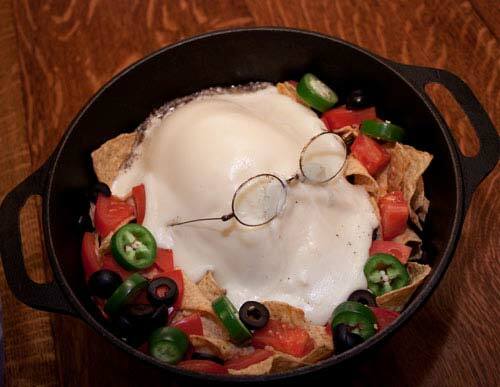 The preparation is simple — line a cast-iron pot with tortilla chips and rest Steve comfortably on top. Garnish with tomatoes, jalapenos and olives. Be sure to show off Steve to your guests at this point, since he'll be unrecognizable soon enough. You'll want Steve to melt quickly without burning the chips, so bake covered at 375 degrees until the cheese is bubbly. Remove glasses and serve with a side of sour cream and/or salsa. Tired of waiting for your new iPad? This tasty iPad Thai will tide you over, and it costs a lot less too. Simply prepare Pad Thai the way you usually do — any variation will be fine. Arrange the noodles on an attractive platter, while leaving room for Steve in the middle. Mount Steve in a well of noodles and provide a knife for those guests who'd like a little cheese with their fusion cuisine. I'll be serving iPad Thai at our iPad launch party — how about you? 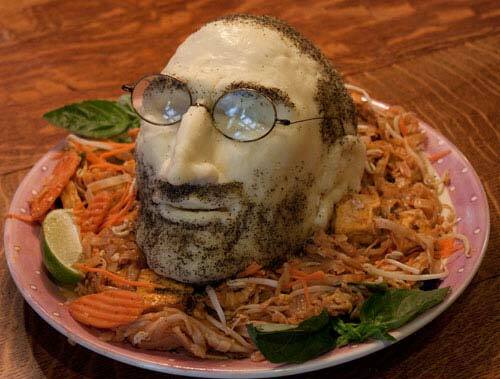 Let me know if you create your own Steve food creation. If anyone has the gumption to put Steve into a pressure cooker, please get in touch. Oh, and let me know if you've got any ideas for what to do with two pounds of melted, pepper-infused mozarella cheese. This is so creative, maybe a little scary to eat but I like it! Where’s the One More Thing…? Dude thats scary. Someone brought that thing to my table, I would run! Quick, send this to Steve Jobs! Manda huevos, cuanto puto corgao por el mundo, por esa regla de tres si admiras a Nacho Vidal, puedes hacer un plato con un pepino y metértelo por el ojete. Por favor señor, llevatelos pronto. you’re the most freeking awesome human being. that’s not always good, but in this case…oh my god!! Genius, but you’re a very weird person, Yossarian. I’ve posted about your clever cheese head on the Prescott Mac Users Group blog. Pretty ironic, considering Steve is vegan. as steve just had a liver transplant, what better food than Pate’ ? with fava beans of course…. This is fabulous. 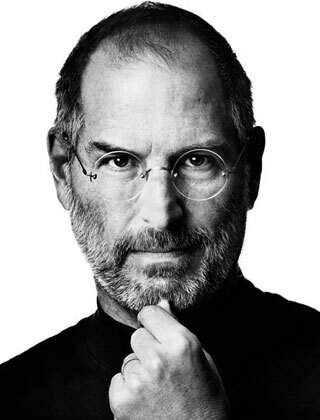 ‘Nough said Steve Jobs should be proud not only of his technological success, but of becoming a cheesehead. 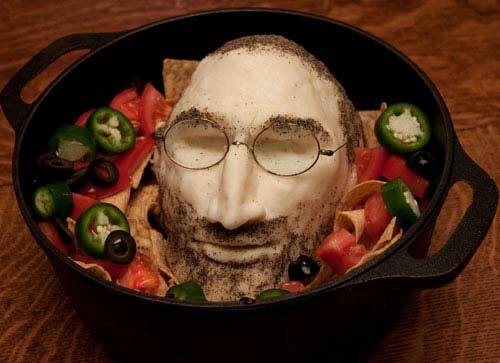 Steve Jobs DIY? No, Steve Jobs DOA….. Can anyone see how insensitive this is considering the be-headings in the news lately? As disgusting as that should be to see it is actually pretty appetizing and interests me. That is a great idea to make creative cheese center pieces to add some class to a party. The only problem is that I would feel bad eating it.